Some people groan at the thought of Christmas letters tucked inside a Christmas card, but honestly, a well written letter from a friend or family member is one of my favorite parts of receiving cards. Despite the fact that these letters are sent to everyone, a good one makes me feel more connected to that person, and really their whole family, and can give me that good feeling that certain Christmas traditions do. 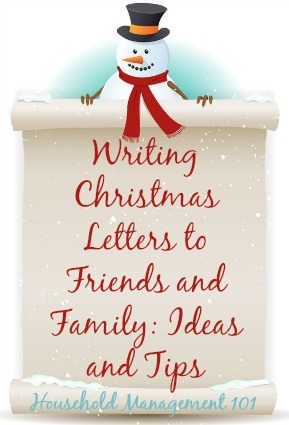 My hope is that by the time you've finished reading this article that you'll be convinced to write your own family Christmas letter this year to place inside your cards, and further that you'll have some good ideas and inspiration to make the process of writing a good quality letter fun and easy. After all, it doesn't have to be hard to be special and meaningful. 1. Be positive. Its easy to start off a letter commenting on how quickly the years has passed but that starts the letter off on a negative point. Start with something positive, The holidays are here again  presenting a perfect opportunity to catch up with each of you, or something similar to that. I understand not everything that happens in a year is positive though. No need to sugar coat or gloss over sad facts, but instead, use this as an opportunity to show your gratitude for some blessing. For example, it is always hard to write an annual letter if a beloved family member (person or pet) died this past year. In such a situation mention this but also mention how much you loved spending time with that individual or a favorite memory you shared with him or her. 2. Shorter is better. Most people receive multiple holiday cards a year. Keep yours short if you want it to be fully read. Keep your letter to one page of single space, 10 point (or larger) font. Keep your commentary on your familys activities and successes through the year brief. 3. Dont brag. It's no fun to read a letter that just feels like one big brag. While you may think your kids are the smartest, cutest, most creative, most musical, most athletic kiddos ever (and they probably are! ), those receiving your letter most likely dont want to read about all their shining glories for page after page. 4. Think about your recipients. Are you sending to business colleagues or family and friends? I don't honestly enjoy reading Christmas cards from anyone that isn't my family or friend, so if you're sending to both business and personal, I would suggest actually writing two letters. Don't make your loved ones read the stodgy business letter! They want to know about you and your family! 5. Keep yearly achievements to a minimum. Describing your year in monthly detail is going a bit overboard for most recipients. Highlight one or two major things per family member or briefly describe the family vacation you were able to take. 6. 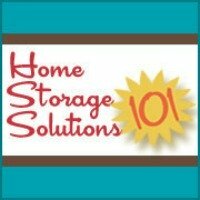 Talk about interests/hobbies you were able to pursue. If you're not supposed to talk too much about achievements, what is there to talk about? Well, people care about what you really care about, so they enjoy hearing about the hobbies and interests you were able to focus on this year. Get personal. It's not as interesting to hear about your son getting on the honor roll (an achievement) as it is to learn that he now swims like a fish, and loves every second of it (something he's passionate about). Other ideas for how to distinguish between achievements (boring) and interests (interesting), include: Do you have a favourite book for the year? Did you work on selling crafts on Etsy? Did you join a monthly scrapbooking club? Mention these things as they provide more dimension to what you are doing these days and make pique someones shared interest. 7. Mention the whole family  don't focus on just the kids. I love hearing about what the kids are doing, I really do, but again, think of the recipient. They are your friend or family, so tell them about yourself and your spouse as well. You were most likely friends or family with most of the people on your list before you had kids and they are interested in what you are doing, as well as what your kids are doing. This is where mentioning your hobbies and a favorite book or a band you discovered this year are great topics as it shows another side of you beyond being a parent and employee. 8. Include appropriate pictures.There are many people who receive your holiday card and letter who dont see you often throughout the year. So, for that reason, include at least one picture, if not several of you and your family. I know I always love these! These pictures can be of activities you enjoyed through the year and vacations you went on, but make sure you and your partner are represented in the picture selections, not just your kids! On the other hand dont put TOO many pictures in your letter or card that it becomes hard to see the details of the picture. Less is often more. 9. Be you. Don't use words you wouldn't normally use. Don't try to adopt a tone that you think is more formal or serious or modern and that you wouldn't use when you are talking face-to-face. 10. Be personal. Include a short handwritten personal note to your recipients to make the card and letter more personal. It doesn't need to be paragraphs, just a single sentence is nice, but it adds a touch to the card that many holiday cards are lacking these days. Bonus (or #11): Grammar and Punctuation. I understand typos and grammar mistakes happen, and I'd rather receive the letter than not if you're going to stress over this, but I do know these things can be distracting. Heck, I know I have typos on my site and several of you (lovingly, mostly) send me emails to help me correct them, so I know many of you find it distracting too! Your letter should be short anyway, so go ahead and run spellcheck and get a trusted friend or family member to read it and help proofread. 1. Postcard. Postcards definitely limit your space, as they are one half of the back of the postcard. You have to be selective in what you write but being concise can be a positive for those reading your letter. 2. Digital Slideshow or Video. You could include a link in your holiday letter to a photo album on Flickr with photos of the year so that people, if they want, can view more pictures of your happenings. Similarly, if you enjoy video editing, a quick video with video clips, cropped still pictures and voice over can be really special for friends and family to receive. Of course, they are also a lot of work! 3. Email letter. If email is more your thing and you have everyones email address, feel free to email out your holiday letter. In the subject line write something that will make it clear that this is an annual holiday letter to help make sure it isnt overlooked and accidentally deleted. Do remember the older recipients on your card list that may not have email access and type out the letter to mail to them separately. 4. Christmas/Holiday themed story or Poem. If you like to write and are creative this can be a truly enjoyable read for your recipients. However, it is a lot more work than a simple letter and if not done well, . . . well, it's not very fun to read. I throw it out there, because some are truly amazing and lots of fun, but they aren't for everyone. 5. Top 10 list. Create a Top 10 list of highlights of the year. This will keep your letter shortened and will be an amusing read as you recount a funny experience, an embarrassing story or a notable achievement. Are Christmas Letters Even Needed Anymore With Facebook & Other Social Networks? Finally, a word about Facebook versus the annual holiday letter. People like reading about what your family has been up to over the last year but you may feel like everyone youd be sending a letter to has already heard all of your yearly news through your status updates on Facebook. This is not the case, and status updates on Facebook shouldnt preclude you sending a letter. Not everyone is on Facebook, for starters. I know it is shocking to think that all of your family and friends arent on Facebook but there are a handful at least on every list that arent. 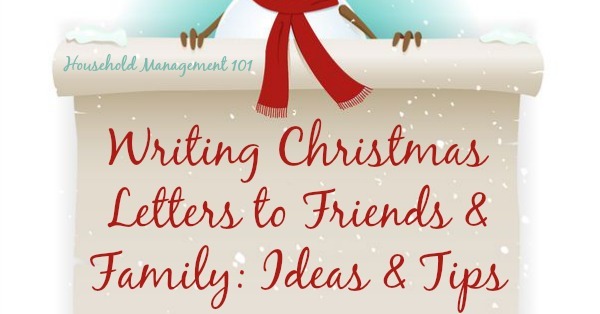 Keep them in mind when you are thinking about doing a holiday letter. In addition, how many people are you friends with on Facebook? How often do you log on? Even those who are on Facebook all day long are sure to miss a status update or two. And most people will forget what happened earlier in the year in your house as there is a tendency to focus on the present as status updates change, and gasp, you aren't the only friend they're reading status updates from. Basically, the annual Christmas letter is a recap of the past year, not an update of the immediate moment. Focus on the broader messages and events and leave the minutiae to Facebook.